Wireless smart syringe pumps offer the flexibility of downloading information and provde bi-directional communication from server-to-pump and pump-to-server. The server to pump communication enables the remote handling of syringe pumps, and the pump-to-server allows the pump to update all information to the server. Smith Group has already introduced Medfusion 4000 Wireless Syringe Infusion Pump that works with PharmaGuard infusion software. This smart syringe pump can reprogram, including drug library and update firmware by itself for critical care and neonatal and pediatric intensive care patients. This trend towards the development of wireless smart syringe pumps is expected to boost the market's growth during the forecast period. "The increased adoption of smart syringe pumps in hospitals, specialty clinics, and ASCs has encouraged many vendors to offer more advanced pumps. IRadmed offers 3860+ MRI IV Infusion Pump, which is a non-magnetic infusion pump used to deliver medication throughout the magnetic resonance imaging (MRI) cycle. Similarly, Alaris Syringe module by BD works with Guardrails Suite MX software to deliver precise drug dosage rates. 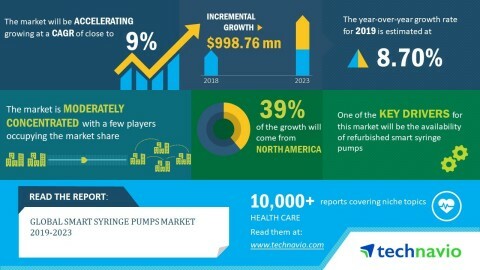 The advent of such technologically advanced smart syringe pumps will fuel the market's growth", says an analyst at Technavio.